Emma-Leigh Murphy is a 21 year old stylist at the Scotia Square Head Shoppe, located right in the heart of downtown Halifax. 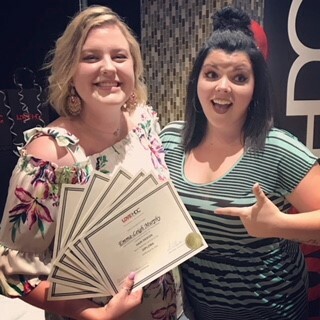 She took the HDC hair program in 2018. Read about her journey! When did you decide you wanted to get into hair styling? I’ve always known I wanted to be a hair stylist since I was a young girl. What made you chose the Hair Design Centre? I chose HDC because I knew several people who graduated from there who are extremely talented. They all praised the instructors and program, so I knew it was the school for me. I am thoroughly enjoying my current role as a stylist at the Scotia Square Headshoppe. When did you know you made the right choice to pursue hair styling? I knew I made the right choice the first time I cut my mom’s hair. My mom had been getting her hair styled for years by top stylists, and I was lucky enough to have her as a guinea pig for my first “uniform cut” on a real person. When I finished styling her hair after the cut, she told me, and my instructors, that it was the best cut and style she had ever had. Do you have any advice for anyone thinking about getting into hair styling? 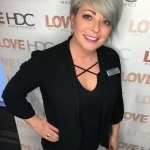 If hair styling is something you’re passionate about, I would HIGHLY recommend going to HDC and taking a tour with their admissions coordinator Dillon Ross. Dillon is great and can answer any questions future students may have before applying to the program. There definitely was is the beginning, but once I got comfortable it became second nature to me. Of course, there are still many things I don’t know but I’m constantly learning new techniques and furthering my education. What did you tell yourself to overcome the hesitation or nervousness? I told myself that s*** happens sometimes, and most of the time it’s out of my control. So, I take a couple of deep breaths if I get anxious and move on. I will never learn anything if I never try. The memories that stand out to me are how interactive and informative the program was, and how close I became with my classmates. I get a lot of inspiration from Instagram stylists because they’re always doing the latest trends. It’s so hard to pick my favourite thing about hair, because all hair is different. One goal I have for myself at the moment is to level jump before our annual Summit. What was your favorite class at the Hair Design Centre? Did you have a favorite teacher? I absolutely loved our foiling class. I found most of the instructors to be extremely helpful and knowledgeable, but I have to give a special shout out to Samantha Buchanan. Sam really pushed me to perfect my foiling techniques and I owe her big time! What are three important skills you need to do your job? Three important skills to have are communication skills, knowledge of products and understanding of the industry.